Last night while flipping the channels I came across a movie that I have seen a couple of times (always by flipping through channels). The movie wasn't necessarily a movie I thought was good, just one of those that catches you and for some reason you can't change the station. Like "Blade 2" or "Behind Enemy Lines", each time you think, "Ok. This time it will be good." It never is. Thus is the film fate of "The League of Extraordinary Gentlemen." Admittedly, I never thought the film was horrible. 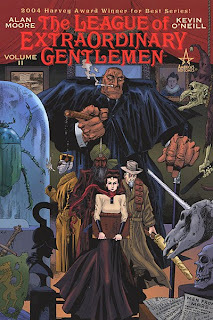 That is until I read the first two volumes of Alan Moore's and Kevin O'Niell's modern classics by the same title: The League of Extraordinary Gentlemen. Moore and O'Niell unite popular fictional characters into a team of "Gentlemen" (and one lady) to fight the threats of England and the world. The League consists of Mina Harker (Dracula character), Allan Quatermain (English hunter and adventurer), The Invisible Man, Dr. Jeykll/Mr. Hyde, and Captain Nemo (Twenty Thousand Leagues Under the Sea). This group joins together in Moore's first story arc, but they show real progression as characters in volume two's second story arc: a retelling of H. G. Wells' The War of the Worlds (coincidentally, Tom Cruise helped it become like another one of those movies described above). Quartermain and Harker's relationship heats up while visiting Dr. Moreau and his freaks; The Invisible Man true self is seen, and Mr. Hyde proves to be vulgar, inhumain, and heroic all in one. The League of Extraordinary Gentlemen: Vol. II is a work of art because Moore doesn't hold back when it comes to how he should treat his main characters. Their fates remain the same as any man...any man attacking a tripod controlled by aliens. The fearless writing and at time graphic visuals make The League of Extraordinary Gentlemen: Vol. II an excellent piece of adult literature and the comic of the day.